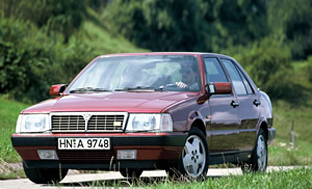 The Lancia Thema 8.32, which was built for just 5 years - begining in 1987, was an unusual mix of bland Lancia Thema saloon styling, and Ferrari V8 power. This strange combination of beauty and the beast engineering came about due to the fact that Fiat (both Lancia and Ferrari's parent company) gave the green light to Lancia to raid Ferrari's parts bin. In that bin happened to be a 3.0 litre V8 producing 215 horsepower and 285 Nm (210 lb-ft) of torque. It was the exactly the same engine found in the Ferrari 308. When this unit was stuffed into the Lancia Thema it endowed the otherwise relatively mundane saloon with a 6.9 second 0-60 time, and a top speed just shy of 150 mph. later cars were ever so slightly slower due to the added catalytic converters which took 10 hp off the peak output. High initial cost, rapid depreciation, and expensive services made sure the Lancia Thema 8.32 was not a common sight on the roads. 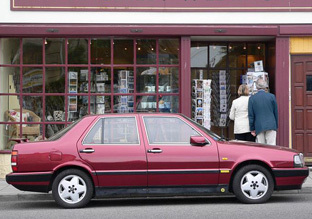 But for those willing to take a chance it was one of the most exciting, if discreet, saloons on the market. And it was all set to a Ferrari V8 soundtrack. 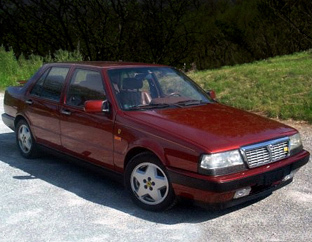 I went to the Italian car festival in Bristol some years ago and a group of lads appeared in one of these. They'd been pulled over by the Police on the way in (probably for being Asian, I sadly suspect) and accused of having a badly blowing exhaust. PC Plod had a significant shock when they told him it always sounded like that and then showed him under the bonnet! !